Accidents, What’s the use to travel at night to save a few hours? – Mohammed Hersi . A hotelier who is passionate about Tourism & Governance in Africa. It is my pleasure to welcome you to my blog. Accidents, What’s the use to travel at night to save a few hours? Waking up to tragic news of 19 dead on Nakuru Mbaruk road is sad indeed . Just the other day close to 40 people perished on Nbi Mombasa highway . Kenyans no longer cringe when they see these numbers. 1. Most accidents involve a truck and a bus sometimes a Nissan van. 2. Most accidents happen at night, many between 2 am and 5 am. Allow me to pose some very hard questions. 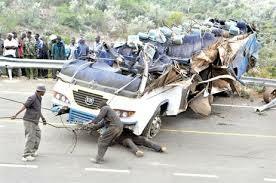 Let us assume the police have failed and indeed they have to stop these carnage . What can we do as individuals?. 2. I have lost 3 close friends in the last 3 months who were involved in an accident at night coming back from a funeral. Family is already mourning why are you so keen to add more misery . 3.Most of these drivers are tired , some are high on something to remain alert hence their ability to make a judgement is seriously impaired. In early 90’s I took a night bus from Nbi to Migori and I vowed never again.its nothing but a death trap. In later years I travel daytime only. 4. These days the drivers survive and they take off from the scene of accident. It means they have an idea what could happen and they keep their side away from the impact. This is real. Good people we see so many people die in accidents we now think it’s normal . It is NOT . Ours is a very sick society but YOU yes YOU can make a choice and avoid being on this killer highways at night. Anything after 9pm on these narrow highways you simply increase your chance to die in accident. At night let trucks have their way , truth be said more often than not it’s a crazy bus or Matatu driver who rams into them It is rarely the other way round. As always I choose to remain an optimist. Let us do what we can to remain safe . Have a relaxed safe weekend. Previous PostAre we that hopeless against the invasive water hyacinth? I refuse to give up . Next PostYou want to benchmark on city planning , go next door Kigali NOT Singapore.